Are you a demand generation marketer focused on leads? A brand marketer looking to raise awareness? 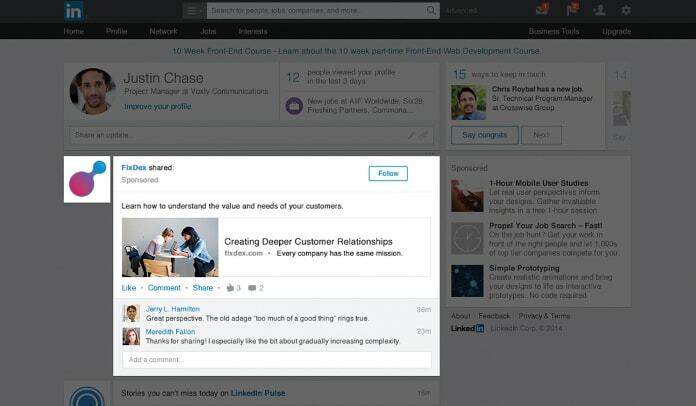 LinkedIn’s suite of marketing solutions is here to help. We can connect your brand with the world’s largest audience of active, influential professionals. Learn how to get started in seven easy steps. 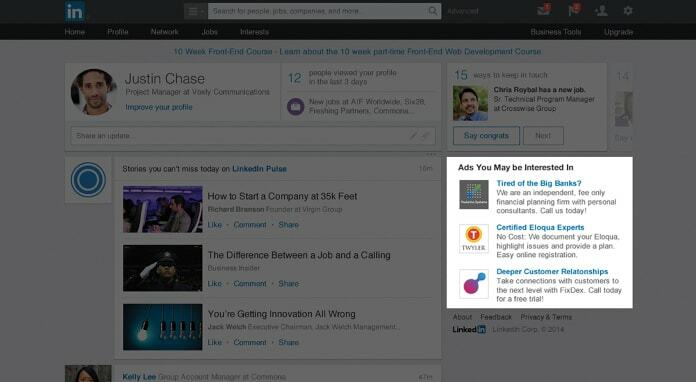 LinkedIn’s self-service solutions lets you launch a targeted campaign in minutes. 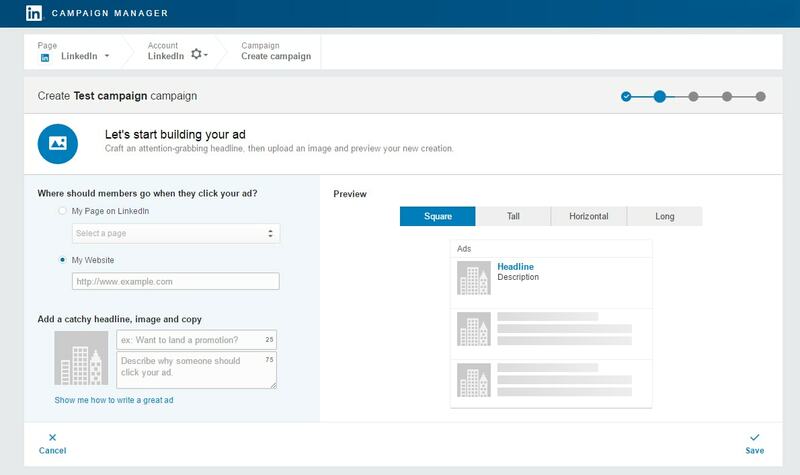 You can set your own budget, choose clicks or impressions, and stop your ads at any time using Campaign Manager, LinkedIn's all-in-one advertising platform. Ad formats supported in Campaign Manager are Sponsored Content, Sponsored InMail and Text Ads. Dynamic Ads are also available through account-managed advertising, which allows you to partner with a dedicated LinkedIn team to create exclusively placed, highly visible ads for premium audiences. The six steps below demonstrate how to run a self-service ad campaign on LinkedIn using Sponsored Content, Sponsored InMail or Text Ads. Get started by signing in to Campaign Manager. If you don’t have an account, you can create one in minutes. Dynamic visual reporting that recalculates and displays only the data that matches your search and filter settings. A detailed breakout of the actions your Sponsored Content campaigns generate, including Clicks, Likes, Shares, Comments, and Follows. A detailed view of the demographic categories of LinkedIn members who click on your ads, available at the account, campaign, and creative level. In Campaign Manager, select the account you’d like to use, then click the Create Campaign button. Then choose from Text Ads or Sponsored Content. If you want to edit an existing update to customize it for a target audience, choose to create new Sponsored Content. It’s a good idea to create multiple variations of Sponsored Content so that you can see which messages get the best results. You can use a variety of messages, links, photos, and images to see what works best. To add rich media, click the paperclip icon in the upper right corner of the text box. Once you’ve created your ad, you can view a preview before saving. If everything looks good, select the content you want to promote within your campaign and click the Sponsor selected button. Choose the sender. The sender’s first name, last name and profile image will appear in the recipient’s inbox along with the subject line of the message. Add message subject line and summary. The summary will give your recipients a sneak preview of your message on desktop. Craft your message. You can add easy personalization (like the recipient's first name) right in the tool. 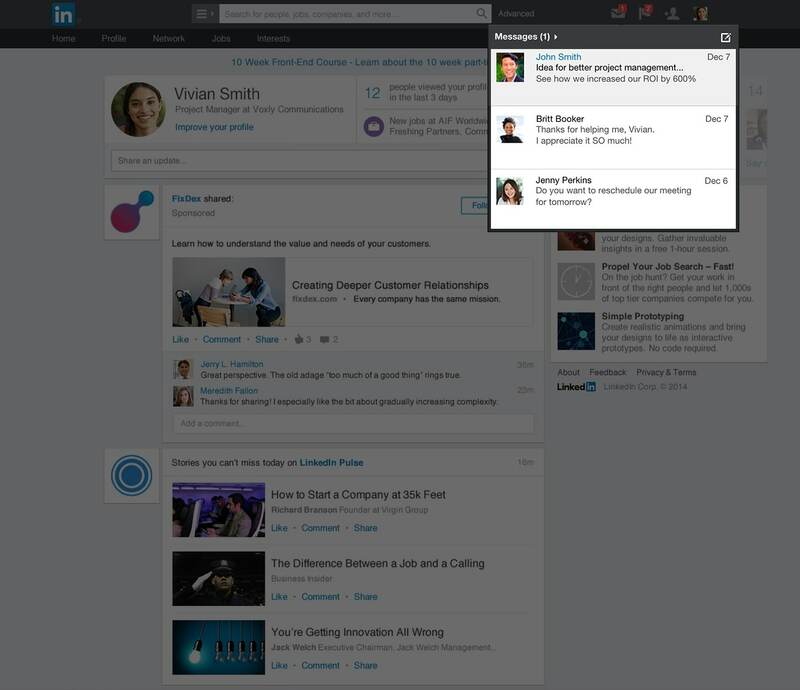 When crafting your Sponsored InMail message content consider the messaging context of the LinkedIn Platform. Humanize your message with conversational language and aim to keep your copy under 1,000 characters. Click Next, and add your landing page URL and optional hero banner image. 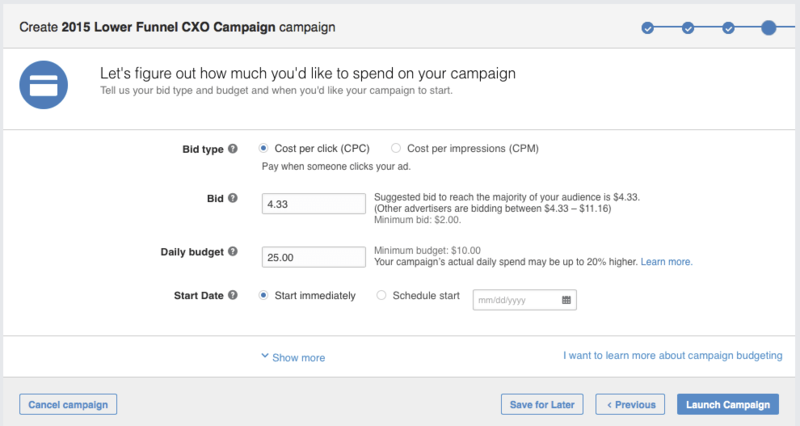 Once you’ve selected the Text Ads option and named your campaign, you can start creating your ad. First, decide where members should go when they click your ad, whether it’s your page on LinkedIn or a specific page on your website. Next, add your image, a headline (up to 25 characters), and a description (up to 75 characters). As you create your ad, you will see a preview on the right side of the page. You can create up to 15 Text Ads to see which headlines, descriptions, and images get the best results. As you can see, there is a wide variety of criteria you can use to select your ideal audience. As you select additional criteria, you will see how each additional filtering option affects your estimated target audience size in the right sidebar. You will notice additional options below the targeting criteria. Audience Expansion automatically includes audiences similar to those you’ve selected. This helps to ensure you’re not missing out on relevant engagement opportunities, especially early in your campaign. You can also choose to deliver your campaign to your target audience beyond the LinkedIn feed, using LinkedIn's network of partner audiences. Now that you’ve selected your audience, it’s time to set the budget for your campaign. There are three options: cost per click (CPC); cost per impression (CPM); or cost per send (CPS). Cost per send (CPS) is used when you run Sponsored InMail campaigns. You pay for each InMail that is successfully delivered. CPC is often used for action-oriented campaigns like lead generation or event registration, whereas the CPM model is typically a better fit when brand awareness is the goal. Along with choosing between CPC and CPM, you will also enter your suggested bid, daily budget, start date, end date, and total budget. Regardless of the end date you choose, you can cancel your campaign at any time. It’s also important to note that LinkedIn uses an auction system for bidding that rewards engagement, meaning you can win an auction without being the highest bidder. Congratulations, your LinkedIn advertising campaign is live! Now it’s time to see how your ads are performing. You can access your analytics by visiting Campaign Manager and selecting the campaigns you want to evaluate. In addition to overall performance, you can also see how your campaigns are performing as it relates to social actions and budget. Social actions are initiated by LinkedIn members who interact with your content – it’s organic, free engagement. 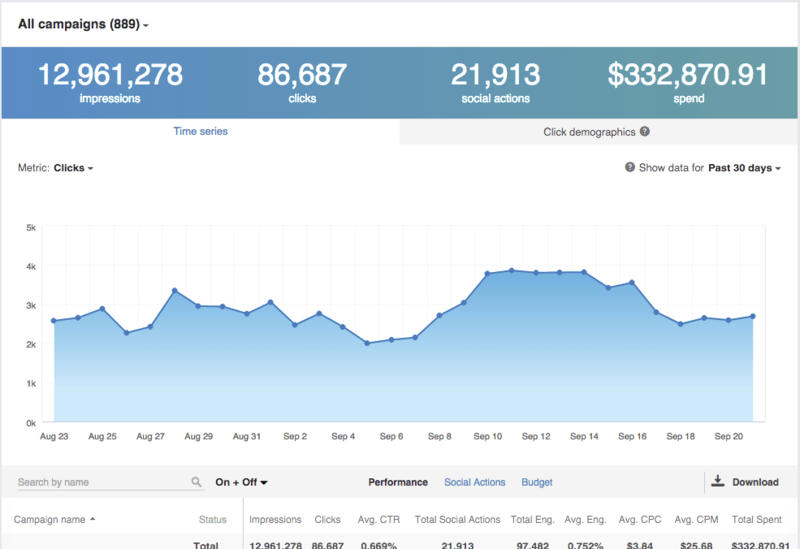 Click through to each campaign to see how each ad within the campaign is performing. Using this data, you can edit your ads, refine your targeting, adjust your budget, and toggle ad variations on and off based on performance. That’s it! 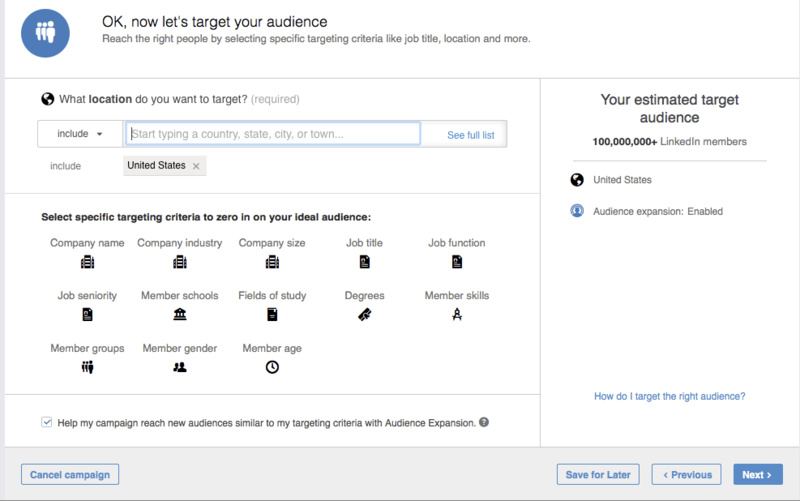 You're now ready to create, run, and optimize ads on LinkedIn. For additional insights and inspiration, check out our LinkedIn advertising case studies or browse our marketing resource center. Now it’s time to reach your ideal customers on the world’s largest professional network. Get started with self-service advertising or contact us to learn about dedicated account team support.